Brazil is a huge country with a huge personality; vibrant historical cities, vast expanses of pristine beaches, lush Amazon rainforests, water and land based adventure activities, serene tropical islands and a fascinating culture including the world-famous annual Rio Carnaval! A comfortable cable car smoothly transports you to the top of Rio’s majestic Sugar Loaf Mountain aka “Pao de Acucar”. The spectacular view from this 404 meter (1, 325 feet) high mountain offers a 360 degree view of the entire city of Rio de Janeiro and its coastline. Since it also ascends through a breathtaking landscape, this attraction is more popular with visitors than even the wonder of the world, the Christ the Redeemer statue, which is also in Rio de Janeiro. Sunset is a favourite time to go on this ride, and if you want to be sure to avoid crowds then the early morning is also a great time. Be advised that on a cloudy day it may not be worth the trip since your view can become obstructed. There are also numerous other things to do in Rio whilst here. If you can get to Rio during Carnaval time you’ll be in for a real treat with four days of hard partying, energetic music and an explosion of colour and sound – it’s the biggest, boldest carnival festival in the world! And of course, thinking a little further ahead, Rio will also host the 2014 FIFA World Cup and of course the 2016 Olympics Games, putting Rio de Janeiro firmly on the global map! Paraty is a small carefully preserved Portuguese colonial fishing village with a fascinating history and quiet beaches along its peaceful bay. Conveniently located within a day trip of bustling Rio de Janeiro, this quiet treasure is home to a historic city center lined with cobblestone streets for the “pedestrian only” traffic. Paraty was built by the Portuguese around the year 1500. After you admire the architecture, rent a boat to soak up the sun and snorkel in the lovely bay. Once considered the sacred burial grounds for two native tribes, the Iguacu Falls National Park consists of 275 separate, tiered falls within a breathtaking span of three kilometers. It’s located in Parana state near the border of Brazil and Argentina in South-western Brazil. They are the largest tiered waterfalls in the world and the view from the Brazilian side of the border affords the most extensive view. Several resorts lie in the area, and those on the adventurous side can take a rafting trip in front of the falls or view them from above on a spectacular helicopter ride. Manaus is the ideal starting point for any treks and guided tours into the wilds along the mighty Amazon River, the second longest river on the planet. This is one of the few major cities near the Amazon jungle. From here there are many tour operators to choose from, and a one week guided trek is recommended in order to really see the jungle. Guides can show you abundant wild fruits that grow here as you journey through the habitat of countless exotic animals. The Fernando de Noronha stretch of island jewels is environmentally protected and truly one of the rare treasures of Brazil. It’s ideal for divers of all experience levels, and it’s also home to many playful dolphins that you can swim with amongst pristinely clear turquoise waters. 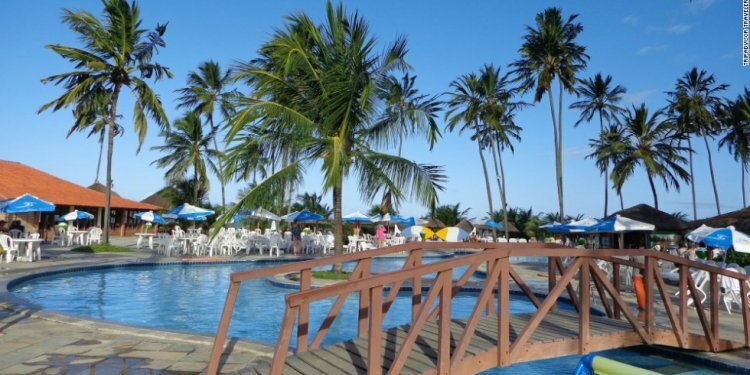 This destination is 200 miles away from Natal on Brazil’s North-eastern coast. Fernando de Noronha consists of twenty islands that can only be visited by a maximum of 420 tourists at a time; these regulations are what have kept this spot a true paradise for the past 500 years.